I recently built my first model — a 1:144 scale Saturn V. I posted this picture of the painted but unassembled rocket online, and it wasn’t long before I got an email from a fellow space-enthusiast. He asked about the paint scheme I used. He used the same design on a model years ago, and neither of us followed the paint scheme of any Saturn V that actually flew. I’d been so distracted following the directions and getting the lines straight that I didn’t stop to look at where the lines were going. It got me thinking about the Saturn V’s design scheme, which might be one of the more interesting histories of paint. Turns out, most of the readily accessible information is geared towards model builders. That’s all well and good, but it didn’t tell me why German-built launch vehicles have always varied their paint scheme. The Saturn V’s iconic black and white paint scheme is a remnant of its German roots. When Wernher von Braun and his rocket engineer colleagues tested early prototypes of the Vergentungswaffe Zwei or V2, they painted a large black and white checkered pattern on its skin. This helped them see any roll the rocket gained around its vertical axis during launch. Armed V2s that fell on London towards the end of the Second World War were painted with a camouflage so the Allies would a harder time finding them. (The V2). The black and white pattern became a standard feature on subsequent rockets built by von Braun’s team. After the German rocketeers surrendered to American solders in 1944, von Braun and 110 colleagues were brought into the United States. The majority went to White Sands, New Mexico, and became the core of the Army Ballistic Missile Association (ABMA) where they developed rockets for the US army. The Redstone was the first rocket NASA used to launch astronauts. The Mercury-Redstone version was similar to the elongated Jupiter C and Juno I with a different paint scheme. Unlike its predecessors, the Mercury-Redstones had a pattern of alternating black and white stripes on its upper stage for ground tracking purposes. Fifteen fixed cameras followed the rocket during launch; its azimuth and elevation could be determine by measuring the vehicle’s paint pattern, as well as its light source and exhaust, against reference targets. The Mercury launches. The two on the left are the suborbital flights on Redstones; the four on the left are the orbital flights on Atlases. The stripes disappeared when Mercury proceeded to orbital flights and the Atlas launch vehicle took over. Built by Convair, it didn’t have the German origins. The rockets that launched Glenn, Carpenter, Schirra, and Cooper were unpainted so looked like a silver tube with a black capsule on top. The ice from the propellant inside made them look white. 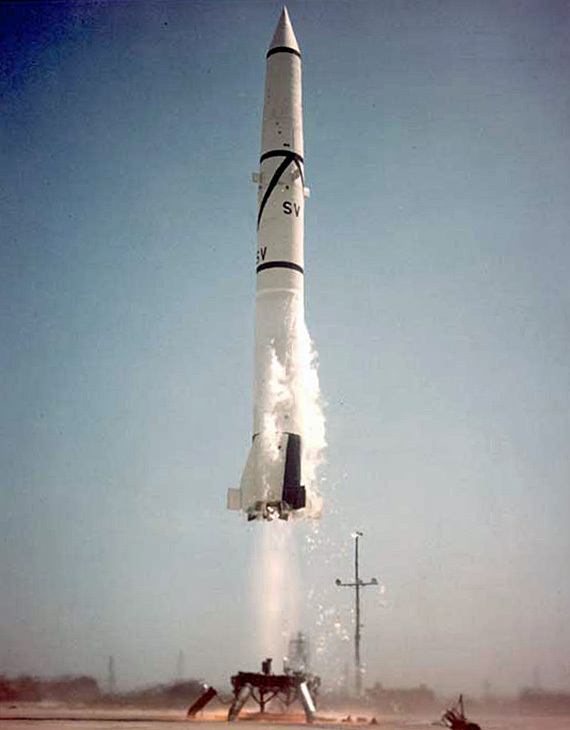 The Gemini program also used American-designed rocket. 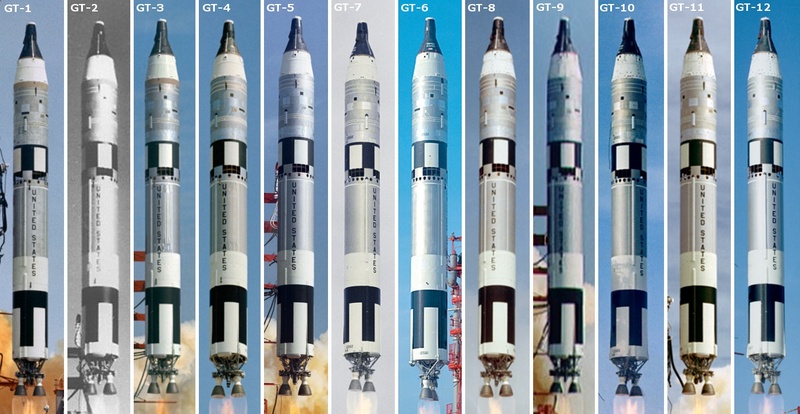 The Gemini-Titan II launch vehicles all had the same look: black and white stripes on the midsection for optical tracking and an otherwise silver body. The Gemini launches all looked the same. The German rockets resurfaced with Apollo. The followup to the Redstone and Jupiter family was the Saturn family. It was so named because Saturn is the next planet after Jupiter. 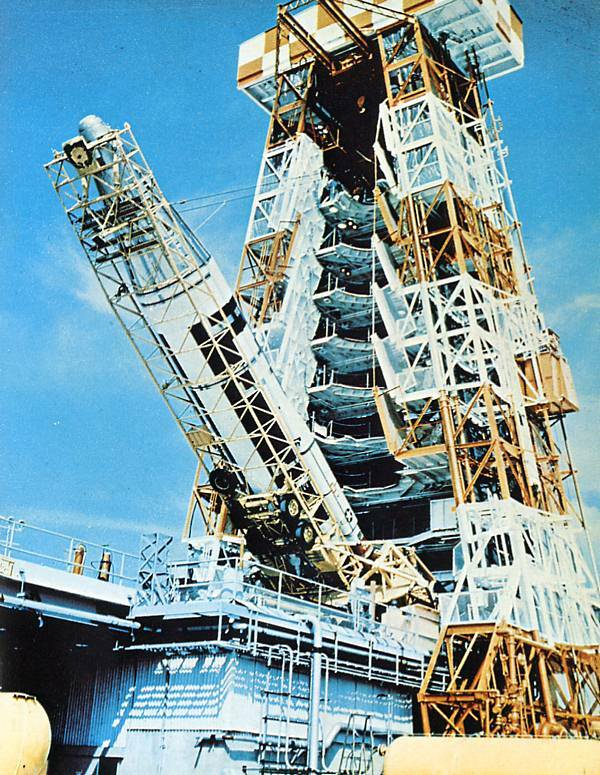 The first version, the Saturn I, was NASA’s first heavy lift vehicle. It was painted with a zinc chromate primer covered with white paint, but its colour scheme changed throughout its lifetime. The first four Saturn I flights — Saturn-Apoll0 1 or SA-1 through SA-4 — featured alternating black and white stripes on the first stage, a small checkered pattern on the interstage, and an all-white second stage. On these flights, the second stage was a dummy filled with water as ballast. But the first stage was loaded with fuel, and heat spikes registered on its skin before launch were a cause for concern. On some missions, the rocket was up to 12 percent hotter than anticipated With spikes on intense heating from time to time. But the black stripes on the first stage remained despite heating issues. SA-5 was the first Saturn I flight with a live S-IV second stage and an aerodynamic Jupiter nose cone painted black. SA-6 and SA-7 carried boilerplate Apollo hardware into orbit and both featured a black forward interstage. The small checkered patterned section was dropped for more white. After the successful launch of SA-7, NASA embarked on a series of three qualification tests of the rocket with Pegasus micrometeoroid satellites as the payload. The black and white stripes on the first stage and aft interstage remained, but the rest of the rocket was painted white with a special paint to reduce the heating factor on SA-8 through SA-10. Heat absorbed by the black paint risked upsetting the satellite’s thermal balance. The Saturn IB was the next big rocket and it featured the more powerful S-IVB second stage. It also marked the beginning of Apollo missions. 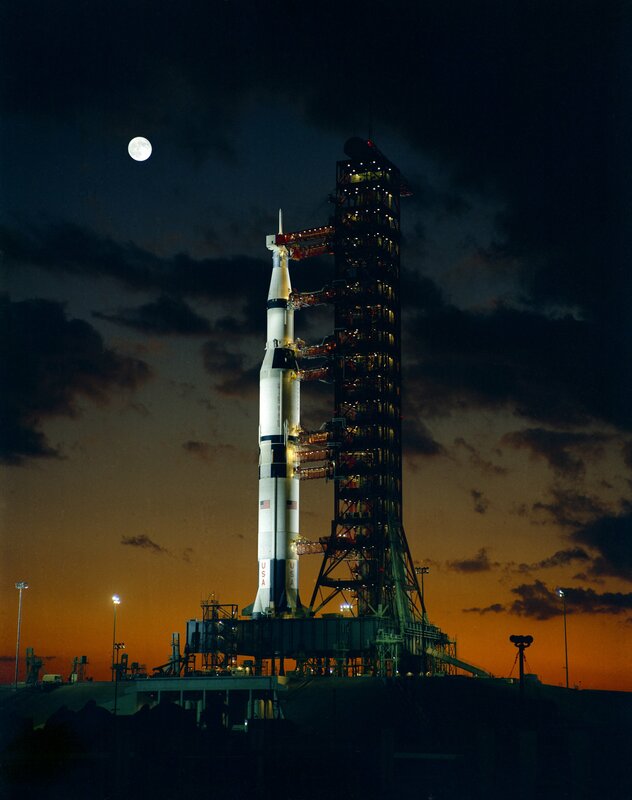 AS-201 — the AS stands for Apollo Saturn — was the first unmanned flight of a Saturn IB in February 1966. The rocket, which carried a block I Apollo command and service module (CSM), was painted white save for the vertical black stripes on the first stage. AS-202 duplicated the flight and paint scheme but added the Apollo guidance and navigation control system and fuel cells to the payload. AS-203 launched in July 1966 without payload to test the power of the second stage. AS-204, which launched on the rocket that was meant to carry the Apollo 1 crew aloft, took an unmanned lunar module into orbit for Apollo 5. Both rockets looked identical. They were the first to have the instrument ring painted black and are distinctively without a CSM or escape tower. The fifth Saturn IB, AS-205, carried the Apollo 7 crew into orbit in October 1967 and followed the paint scheme of its predecessor. Subsequent Saturn IBs launched after the Apollo program ended. AS-206, AS-207, and AS-208 carried Skylab crews into orbit and AS-210 carried the American half of the Apollo-Soyuz Test Project aloft. Heating problems on the first stage changed the appearance. The first stage was painted entirely white on these flights. 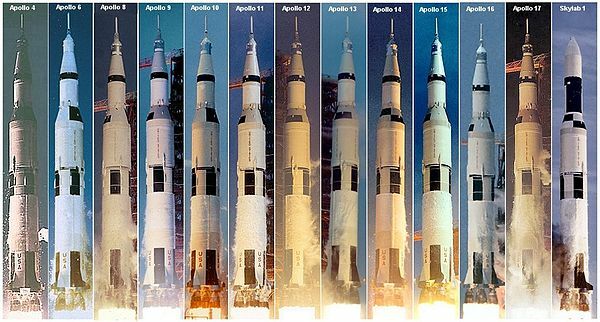 The Saturn V was the last and largest rocket in the Saturn family. It’s first flight was the Apollo 4 mission that launched in November of 1967 (left). This rocket, and all subsequent Saturn V’s that flew as part of the Apollo program, had the same paint scheme. The body was white. Black stripes went about a third of the way up the first stage and continued on the upper part of the stage and the aft interstage ending at a black ring. An uneven black and white checkered pattern was painted on the forward interstage, and the instrument unit was painted black. The CSM was a tiny flask of silver at the top. The last Saturn V that took Skylab I into orbit had an all black upper section. But this isn’t the paint scheme that came with my model Saturn V kit. The first stage is different, with longer black lines and a black band around its middle. So where did this come from if not from any of the Saturn Vs that launched? Turns out, one of the less common Saturn Vs is the inspiration behind this design. 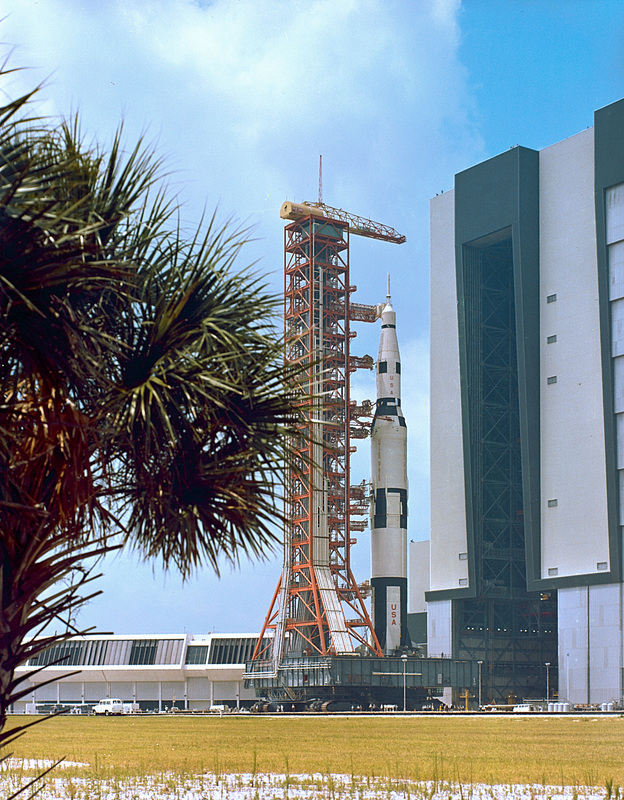 The first Saturn V that rolled out of the Vehicle Assembly Building in 1966 was a dummy rocket never intended to fly. Designated Apollo-Saturn 500F, it was used to verify the Apollo launch facilities, train launch crews, and develop test and checkout procedures. This was the rocket that men physically shook to see how the structure would hold up in the event of strong winds on the launch pad. This original Saturn V paint scheme, it seems, has been the inspiration for model kits ever since. 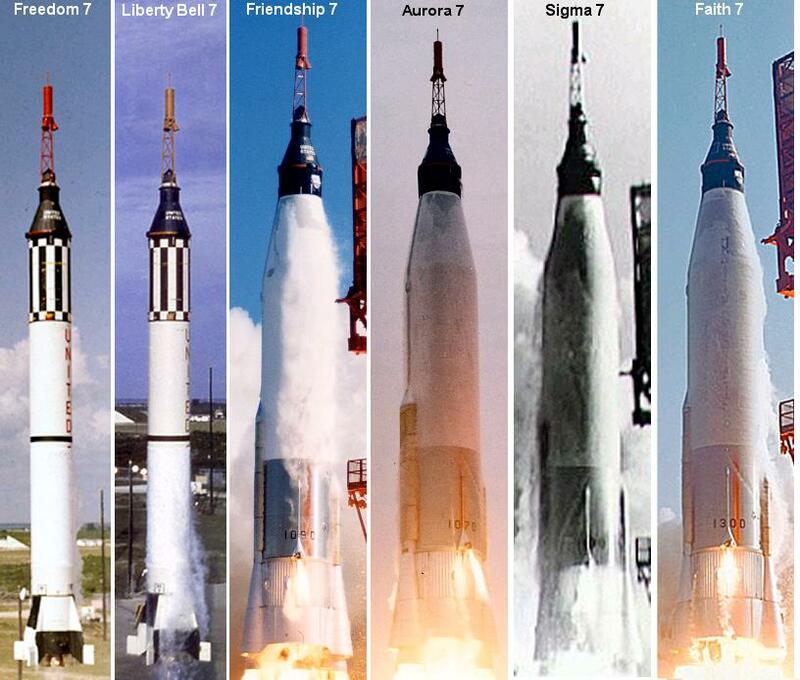 Searching through mission reports from the early Redstone flights, the Saturn I flights, and the Saturn IB flights, the changing paint scheme becomes clear. But the reason behind the changes is only mentioned in some of the reports, and there is hardly a mention of why a scheme was chosen for a rocket family in the first place. It’s possible it’s purely stylistic; the first Shuttle was painted all white because it was attractive, but the weight of the paint on the large external tank was substantial. Eventually the tank was left unpainted and orange, freeing up over 2,000 pounds for cargo. Maybe it is a stylistic reason. No one can deny that the Saturn V looks awesome, though I’ve always had a soft spot for the sleek lines of the Gemini-Titan launch. 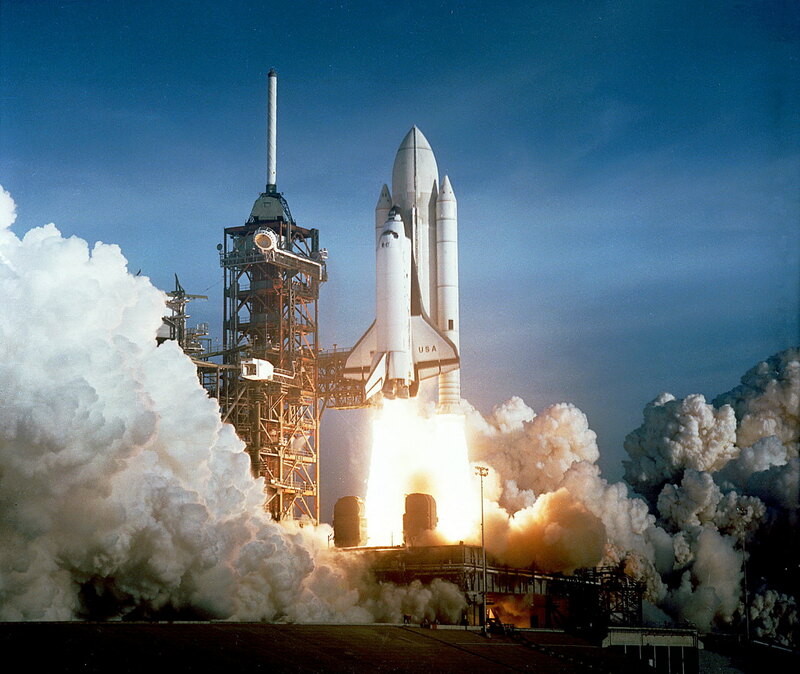 The stylish but heavy STS-1 launches on April 12, 1981. Stages to Saturn: A Technological History of the Apollo/Saturn Launch Vehicle By Roger E. Bilstein. NASA History Series. 1996. “Postlaunch Report for the Apollo Mission A-101.” MSC, Houston. NASA. 1964. “Apollo Systems Descriptions Volume II.” Marshall Spaceflight Centre. NASA. 1964. “The Mercury-Redstone Project.” Saturn/Apollo Systems Office. NASA. 1964. Thanks, that was really interesting. A good read about something you don’t hear about much. Paint in space. Can’t get over the weight of the paint on the shuttle tank! Enjoyable read. I used to wonder about the checker pattern. Now I know. Thanks. It may be exceptional geekery on my part to notice that the black areas on the interstage at the top of the 2nd stage of (most?) Saturn Vs could be read as a quadrant number in 2-digit binary code… maybe for roll retrieval from even marginal photos? The Atlas used a bare metal body, and what makes it look white is the frost on the LOX tank. Presumably the reason for not painting the body was to reduce weight. This was the missile with skin thinner than a dime, which had to be kept in traction, or overpressured with nitrogen, when it was empty so that it didn’t collapse. I think the engine section was also unpainted, except possibly on the early test flights. I never paid attention to the paint on the Saturn V in “Apollo 13,” but now I have an excellent excuse to watch that movie again! And I haven’t seen “Cowntdown” but I did just get a copy. I’m adding it to my growing collection of not strictly sci-fi space age movies. Just adding to the discussion of paint themes following David’s reference to Apollo 13, here’s a clip of the launch scene. It looks like the black lines on the first stage seem to go higher than they do on any of the Saturn Vs that flew, they reach higher than the USA painted on the side, but there isn’t a horizontal band like on the Saturn 500F or the model that I (and others) have painted. There also seem to be black blocks on the SIVb which don’t belong there. Oh well, it’s a film and the graphics look great. As a side note on our German rocket heritage. Willey Ley wrote that the Fritz Lang film “Frau im Mond” started with the message “10 seconds to go….6, 5,” etc. So the original countdown was a cinematic tool for dramatic effect in a German film. I recently watched Frau im Mond for the first time (believe it or not, Blockbuster Online actually has it!). Previously I had only seen a few stills. 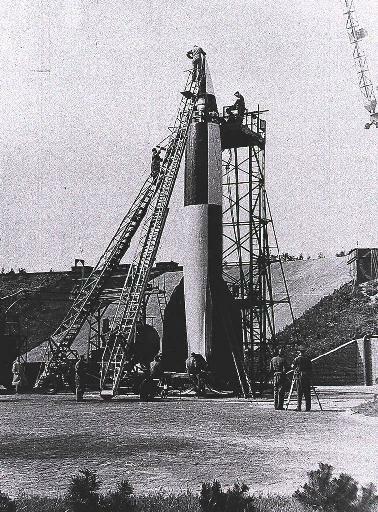 It turns out that the rocket in the film, the Friede, is mostly light-colored, with dark roll patterns. . Hermann Oberth (the first German rocket science writer) was technical consultant to the film. He was the inspiration for the first generation of German spaceflight enthusiasts, many of whom eventually became members of the Verein fur Raumschiffahrt (Society for Space Travel) – including Von Braun himself. Of course, Frau im Mond is a black and white film, so I can’t be sure; however my guess is that the Friede was intended to be white with black stripes. I wouldn’t be surprised if the V-2 team was making a nod to the film (besides the legitimate technical reasons) in their choice of colors for test V-2s, considering the high regard in which they held Dr. Oberth. I’ve read that the first flight-test vehicle had a bit of cheesecake art painted between two fins: a woman sitting on a crescent moon, with the lettering “Frau im Mond” painted underneath. I’m a fan of tradition. If the SLS ever gets built, I hope it retains the white/black roll pattern paint scheme portrayed in the official NASA conceptual images. However, the record of NASA manned rocketry and spacecraft projects since Shuttle reads like this: Orbital Space Tug (canceled); DC-X (canceled); X-34 (canceled); X-37 (transferred to USAF); X-33 (canceled); Orbital Space Plane (canceled); X-38 (canceled); Constellation (canceled)…Who wants to bet that SLS will be anything other than the “PowerPoint engineering” projects to which we’ve been subjected for the last 30 years? Paint patterns on the Saturn V and other rockets was primarily so that roll was visible from the ground for observation and filming. Fins on the first stage were also labelled for easy identification. You can find technical documents here including the paint templates http://www.up-ship.com/drawndoc/drawndocspacesaturn.htm Lots of good stuff. thanks for this… i always knew there was a reason but never knew the history behind the reason… thanks! A very informative article- I’ve wondered too! And I think I might want to create a montage of the montage of images here- it’d make a fabulous desktop wallpaper. Welcome to the wonderful world of space modeling! It’s traditionally been a male-dominated hobby; so I’m thrilled to see more women becoming involved in it! I wonder if a gallery can be added to this site? If so, perhaps those who are space modelers could post photos of their handiwork. I, for one, would love to see the finished result of your Saturn V project! I’m currently building a 1:100 scale model of the same rocket; it will be a hybrid of the Revell plastic model (won on e-Bay, a rare occurrence for me! ), and of more accurate, card-stock model parts from the Web. Incidentally, card-stock or “paper” modeling is a whole Internet universe in itself; and many such websites involve space modeling, from “real space” to conceptual (but never built) vehicles, to science fiction. 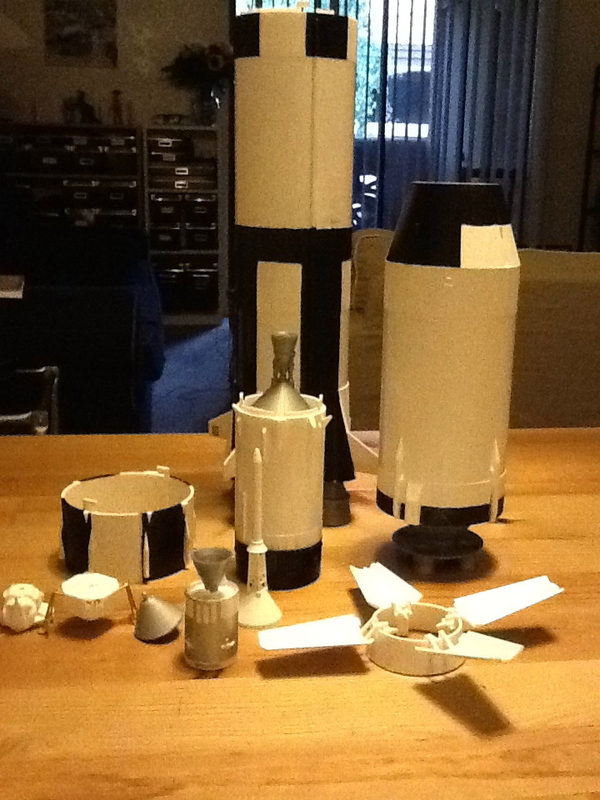 There’s a very good paper space modeling Yahoo group, which I would recommend to any space enthusiast for a look-see. Great summary article (as always) on the discrepancies between model painting instructions (usually based on the Saturn 500-F “Facilities compatibility” prototype) and the flight vehicles, as well as the thermal problems of too-much black striping. Thanks also for listing the link to the Apollo-Saturn Reference Page, the gold standard for modelers. Re. the white-painted ET on the first couple of STS missions: I’ve read that the white paint was initially considered necessary to reduce cryogenics boil-off, in addition to the foam insulation. Later, of course, it was found to be unnecessary, and, as you pointed out, a weight penalty. Peter Alway’s “Rockets of the World” is a great resource for scale modelers. Also, several model rocket companies offer very accurate scale models of several historic rockets. Apogee Components and Semroc Astronautics are two that come to mind. Another excellent article…I really enjoy checking your site out! BTW – looks like a good job on the Saturn V – would love to see it after the decals have been put on it.